"(Dr. Heimlich's) ideas are insane," (said Robert Baratz MD PhD, president of the National Council Against Health Fraud). "Some of his ideas are delusional. He has been experimenting on human beings for most of his career, and he's no different than the Nazi experimenters. There isn't one iota of scientific basis for this except that Heimlich said so." Per this screenshot from the website of Cincinnati's Heimlich Institute, for decades my father has been recommending that the Heimlich maneuver (aka abdominal thrusts) be used to revive unconscious choking victims. Click here for a page on the organization's website listing dozens of cities and towns where kids have been or will be trained. The list doesn't identify who conducted the training or at what facility or school. According to her LinkedIn bio, Heimlich Heroes program director Terri Huntington has no medical training and her last job was working for a multi-level marketing company called The Pampered Chef. When I asked her for any evidence supporting the use of "the Heimlich" to revive unconscious choking victims, she instructed me to go away. Eric Perez MD is an emergency medicine specialist at Mount Sinai St. Luke's Hospital in New York City who reviews medical treatments posted on the website of the U.S. National Library of Medicine (under the aegis of the National Institutes of Health). To my knowledge, there is no definitive evidence for or against performing abdominal thrusts in unconscious patients. Certain entities, such as the American Heart Association and the American Red Cross, do not recommend using the Heimlich maneuver on unconscious patients......Heimlich Heroes, a Cincinnati-based first aid program developed partly by Henry Heimlich, is teaching students to perform the Heimlich maneuver on unconscious choking victims. This means that school children are being taught a medical practice that is not recommended by the American Heart Association or Red Cross, two highly credible public health organizations. 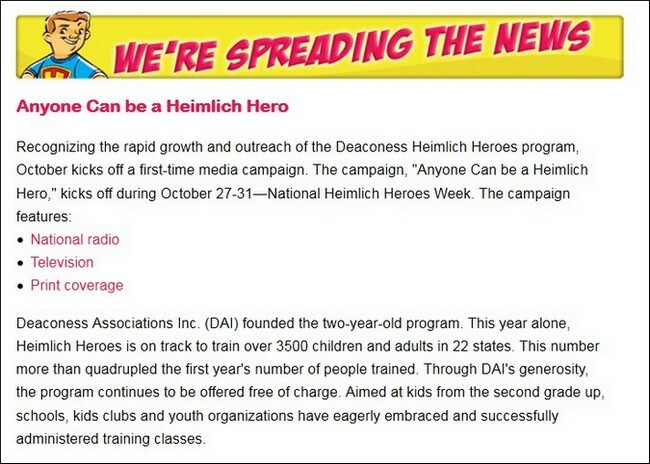 Based on the above, unless I'm missing something, Heimlich Heroes appears to be using young people around the country to circulate an experimental, unapproved medical treatment. The program was also recently tagged by the National Institutes of Health for circulating false information. I'll fact-check that claim with those three organizations and report the results.